Chinese New Year 2019: What Should Tourism-Related Businesses in Europe Expect? How Many Outbound Chinese Travellers? During Chinese New Year (Spring Festival), more than 400 million Chinese people will be travelling. Most of them will use the official holidays to see family members and friends in other parts of China, but already about seven million tourists will travel overseas in 2019. Last year, the number of Chinese outbound travellers during Chinese New Year amounted to 6.5 million people. Although the amount of time spent abroad during Spring Festival holidays has increased to about seven to 10 days, most outbound tourists still prefer Asian countries as their main holiday destination. This is partly due to the geographical and cultural proximity of neighbouring countries, and to some extent to the high costs involved in long-distance overseas travel. For a few years now, however, Europe has also become one of the top preferred destinations for Chinese travellers taking advantage of the Chinese New Year holidays. 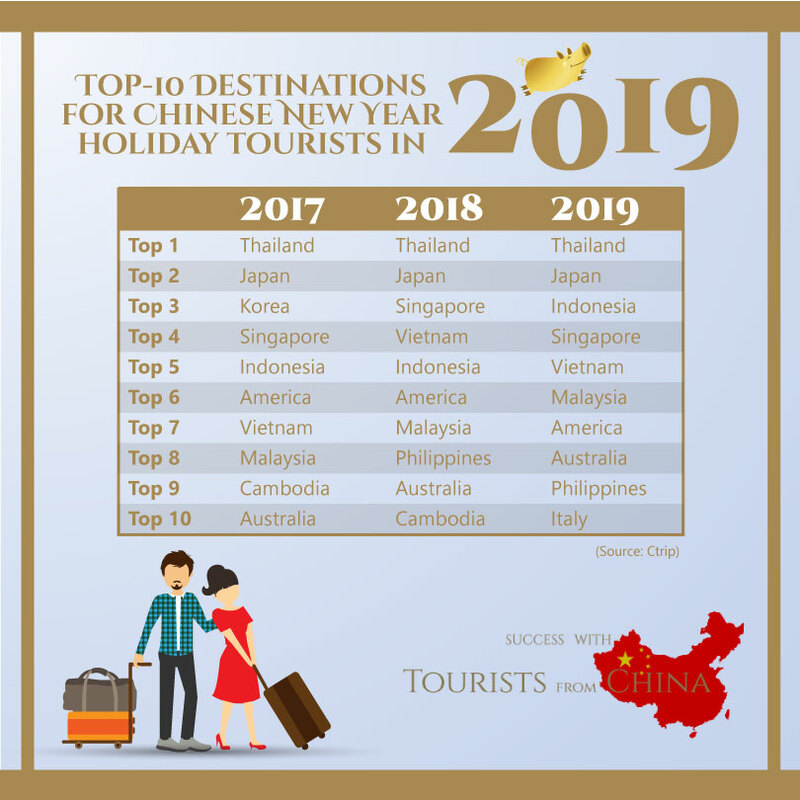 First takeaway: An increasing number of Chinese tourists are travelling abroad during Chinese New Year 2019. Their length of stay abroad is increasing year on year as well. This is good news for European tourism-related companies. With more Chinese people coming to Europe and now staying for a longer time period, there are excellent business prospects to be found! What Are the Top-10 Destinations of Chinese New Year 2019 Travellers? Based on statistics from Ctrip, China’s largest online travel agency (OTA), Thailand will be the number one destination for Chinese outbound travellers in 2019, followed by Japan, Indonesia, Singapore and Vietnam respectively. In the list of the top-10 destinations for Chinese tourists travelling abroad during the Spring Festival, we find for the first time Italy. The remaining destinations in this top-10 list include Malaysia, the United States, Australia and the Philippines. Second takeaway: Europe is becoming one of the top preferred destinations of Chinese travellers during the Spring Festival, with some countries leading this development. European companies should start to attract Chinese tourists and take advantage of the fact that this tourism sector offers business in a typically low travel season in Europe! How to Prepare for Chinese New Year Travellers? Many European tourism-related branches in large cities prepare for Chinese tourists coming to visit. In London, for example, the famous department store Harrods attracts tourists with a Chinese New Year decoration that centres around this year’s zodiac animal, the pig. Among the products offered especially to Chinese customers are the Gucci ‘piggy print’ clothing line. Luxury brands such as Gucci will capitalise on the Spring Festival season, when Chinese travellers are prepared to spend a lot of money on exclusively designed pig motif goods. To make shopping for Chinese tourists more convenient in Paris, the Galeries Lafayette Group’s BHV Marais cooperates with WeChat Pay. Offering this service to Chinese travellers increases the attractiveness of shopping in the high-end department stores of BHV Marais. With 2.2 million Chinese tourists visiting France in 2018, the country was the second main tourism market of China after the US. Third takeaway: To make your business more interesting to Chinese New Year travellers, you should use the relevant sign of the zodiac in the promotion of your products or services. Another way to call Chinese travellers’ attention would be the release of a New Year’s special edition. Accepting the online payment methods that Chinese tourists prefer, such as WeChat Pay or Alipay, will also help make your business more appealing to Chinese travellers. What Is the Spending Power of Chinese New Year Travellers? According to Ctrip, consumer spending during last year’s Spring Festival amounted to about CNY 475 billion (EUR 61 billion) cumulatively in China and abroad; it is expected to further increase this year. With the growing income of many families, parents’ ‘red envelopes’ (containing money as a gift for Chinese New Year) given to their children will be another source for travellers’ Spring Festival shopping tours. On average, Chinese tourists spent about CNY 3,500 (EUR 456) during their Chinese New Year’s travels within China in 2018. Expenditure during international travel totalled CNY 9,500 (EUR 1,240). 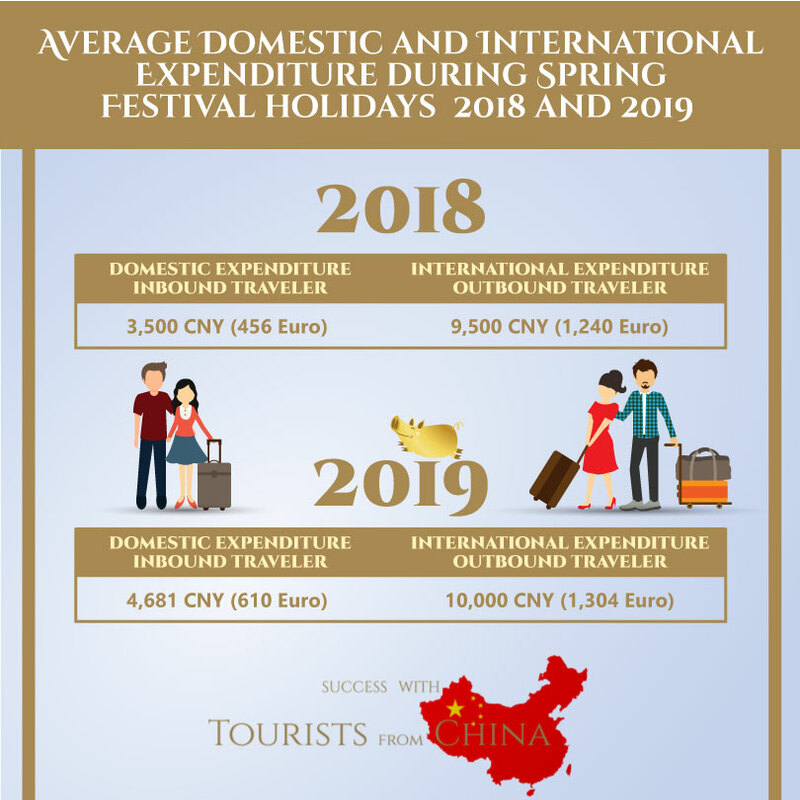 For this year’s Spring Festival, the average expenditure during domestic travel is expected to rise to CNY 4,681 (EUR 610) and for international travel to about CNY 10,000 (EUR 1,304). Fourth takeaway: The spending power of Chinese outbound travellers for Chinese New Year 2019 is increasing. Therefore, Chinese tourists are becoming an even more interesting target group for tourism-related companies in 2019. This development deserves your attention! Take this chance to enter the Chinese outbound tourist market now, and to explore its huge opportunities! Be prepared, and enter the market with the right strategy. It will be our pleasure to support you with our key offerings. You can book your free discovery session here. Do you know that Chinese New Year is a peak season for Chinese outbound travellers? Do you know that Chinese New Year travellers are especially an interesting targetgroup for European tourism related businesses? « #10 Why you should pay more attention to Chinese outbound tourism in 2019?